Located on Cora St, one of the most charming and historic streets in town, Alte Friedrichsburg doesn’t disappoint in telling the history of early 1900’s Fredericksburg. Lavishly decorated with native German settler antiquities, this is one not to be missed by aficionados of history and unparalleled elegance. Arriving at the home, you can't help but be immediately charmed by its cheerful pale blue paint and inviting front porch. However, these two aspects are just a taste of the wonders that await you inside. Branching off from a pleasant foyer, to the left you'll find a resplendent parlor occupied by opulent seating, a lavish oversized rug, and handsome historic oak flooring while to the right lies the first bedroom that features a grandiose canopy bed appropriately named “the honeymoon suite” and complimented by the oak floors continued from the parlor and foyer. 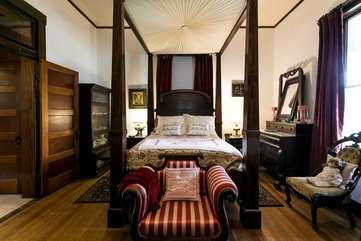 Further in are a lovely second bedroom with an ornate wooden headboard and a second seating area that is a bit less formal than the parlor but just as exquisitely furnished. Both bathrooms in the home feature desirable gray stone floors with one featuring a romantic clawfoot tub with handheld shower and the other a modern walk-in shower. The true gem of the home though has to be the spectacular dining room. A grand oak table with seating for 8 is encircled by exceptional wooden display cabinets brimming with delicate crystal and polished silver that is certain to make each meal a special occasion.